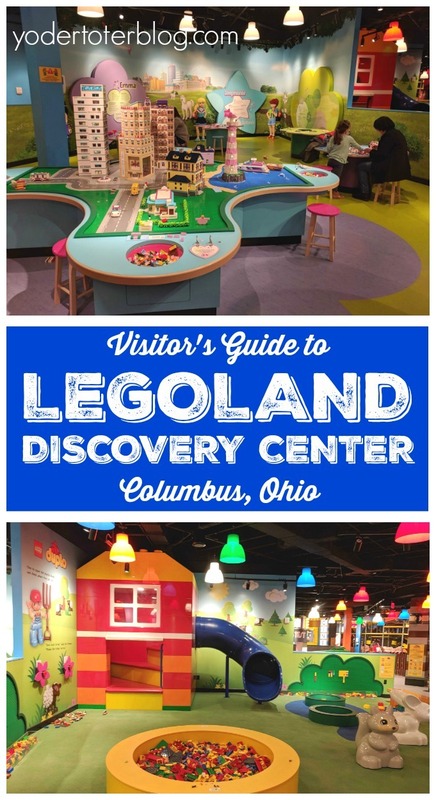 The LEGOLAND Discovery Center opened in Columbus, Ohio in fall 2018. Our family took a very cold Friday to enjoy this completely indoor attraction! Here’s my LEGOLAND Columbus review. 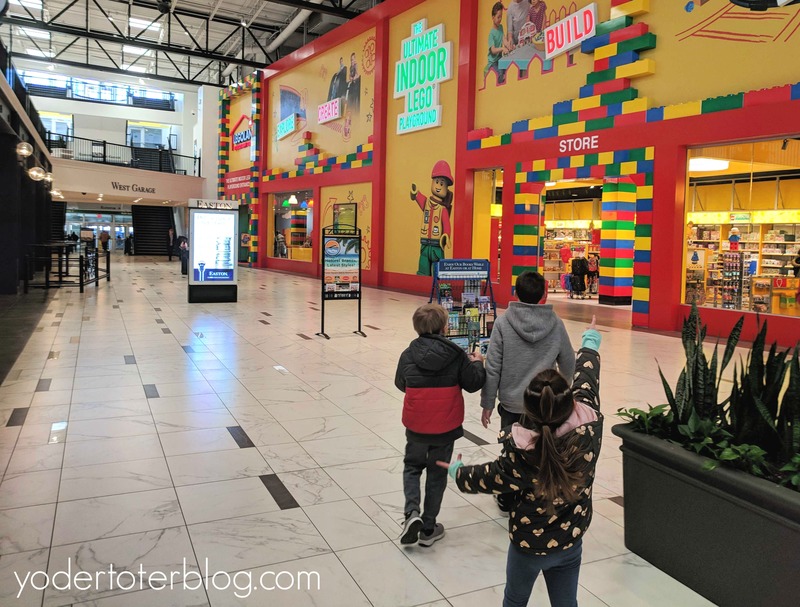 The LEGOLAND Discovery Center is located inside Easton Town Center. The closest parking garage is the West Covered Parking Garage. The entrance to LEGOLAND is located on the ground floor, although once inside, this is a two-story attraction with both stairs and an elevator. LEGOLAND is open Sunday-Friday from 10 am- 7 pm and Saturdays from 10 am- 8 pm. The last admission is at 5 pm. Adults must be accompanied by a child! The current LEGOLAND admission price is $24/pp over 3 years old. Pre-purchased online tickets are available for $20/pp over 3. If you receive LEGO magazine, there is a coupon inside for Buy 1 adult, get 1 child free. I asked my mom to tag along, so was able to receive two child admissions for free. Our total for 5 people was $72, considerable savings from the online rate. LEGOLAND memberships are available but it is $60/pp for families with more than 3 members! Membership for our family of 5 would be $300! Here’s where I kick myself for not buying the memberships they were offering before opening day – they were priced considerably less. LEGOLAND Discovery Center is both wheelchair and stroller accessible. You are able to take in a small cooler with snacks or lunch! Make sure you pack something to eat because if you’re just visiting on a day pass, you will not be able to leave the center and return. As of February 1st, this will only be a perk for those with a membership. I’ll admit, I was worried that LEGOLAND Columbus would be a bit of a letdown after visiting LEGOLAND Florida! However, the kids were totally on board and happy with the experience (as was this mama). Before going, I did warn them that the Discovery Center would not have the caliber of rides that the amusement park offers. But, if you can’t travel to Florida or California, it’s a worthwhile alternative. LEGO has done a great job of appealing to all types of fans with different kinds of attractions. In the first exhibit, kids and adults can try their hand at creating their best LEGO minifigure in the LEGO factory. In Kingdom Quest, riders shoot lasers at sneaky skeletons, spiders, and bats! I also appreciate that rides cater to younger explorers. On Kingdom Quest, if you aren’t 4’3″, you just have to ride with someone who is taller (a.k.a. big brother). Then it’s on to Miniland which is themed towards Ohio’s three cities- Columbus, Cleveland, and Cincinnati. 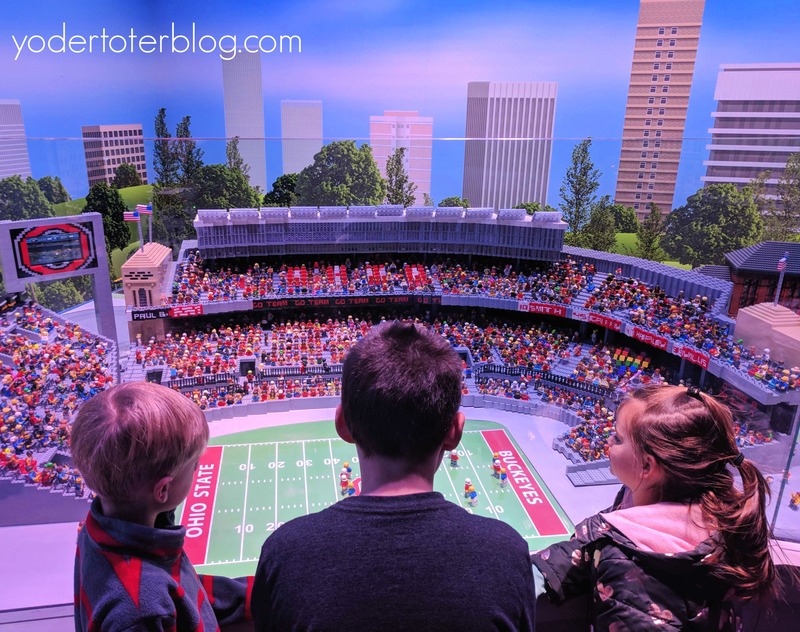 My children gravitated to the replica of the ‘Shoe that’s filled to the brim with minifigures worth examining! Kids can also make the LEGO figures score a touchdown. Big brother didn’t want to leave this spot. 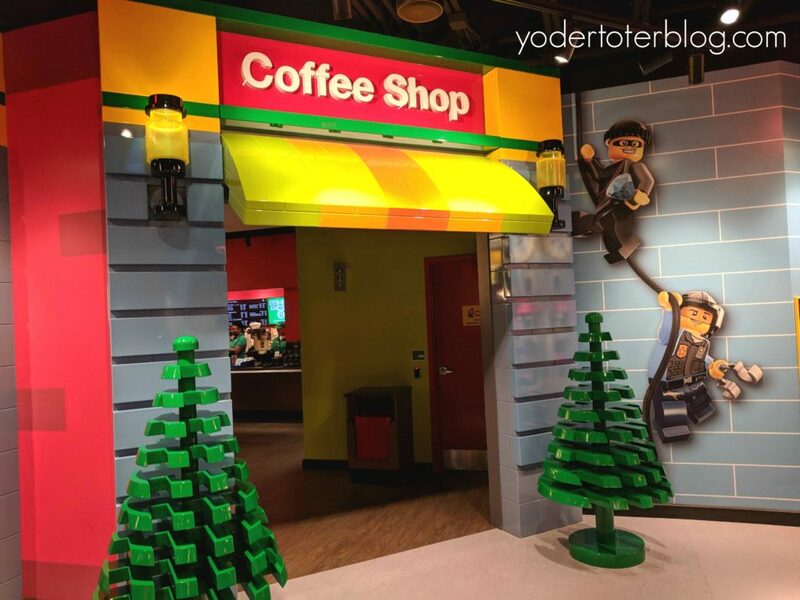 In the main area of LEGOLAND Columbus, there are numerous stations for the family! 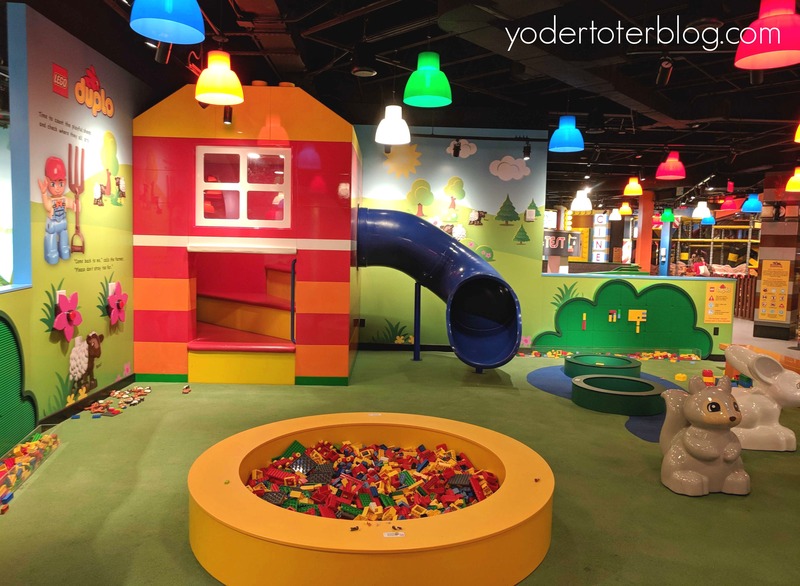 The DUPLO area would be perfect for toddlers- a small slide, DUPLO blocks, and large LEGO bricks are extra inviting in primary colors. 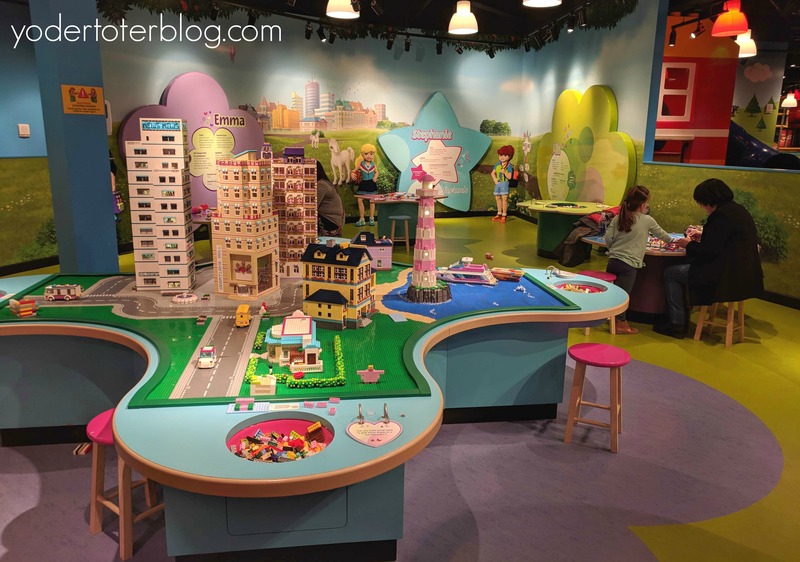 Our daughter’s favorite area was dedicated to LEGO friends. Near this station, you’ll find the Creative Workshop. Builders of all age learn to build a small LEGO figure by a Master LEGO builder. Times are posted outside of the room for when the instruction takes place! There is also a small coffee shop that offers coffees, cakes, and cookies, as well as pre-packaged sandwiches and snacks. Adult lunches begin at $12 and kids’ meals are $8. 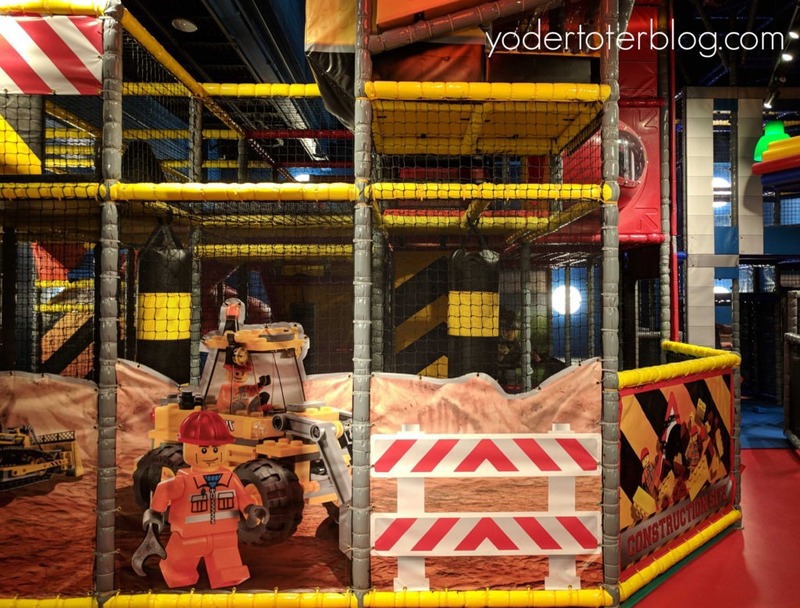 Our active boys enjoyed so much about LEGOLAND Discovery Center but I do think the LEGO CITY jungle gym was the highlight of the day! They visited twice and didn’t want to get out! Merlin’s Apprentice Ride was another favorite! Riders pedal each 2-person car to make it go higher and higher! 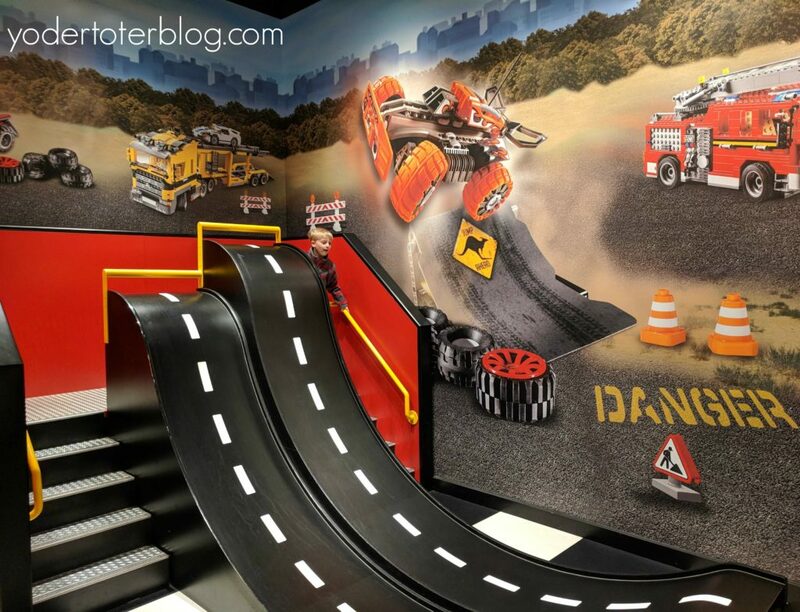 Another area that was a hit with our boys was the LEGO Racing Build & Test area! The boys enjoyed creating different cars and seeing how quickly they’d make it down one of two ramps! 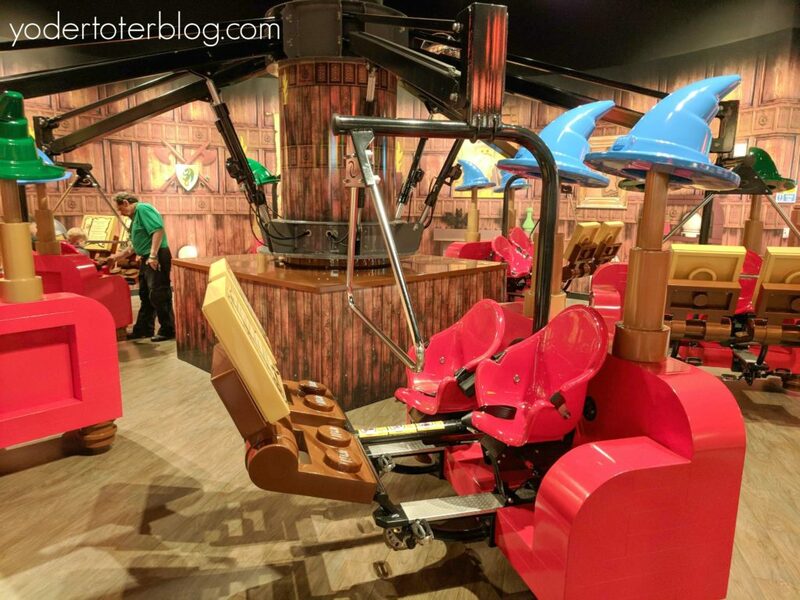 There’s also a 4D theatre, which at the time was running a Ninjago, Nexo Knights, and shortened LEGO Movie. Times for each show are posted outside of the theatre. There is no limit to the number of movies you can see and they are included in admission. Just be prepared to get a little wet! Overall, we had a GREAT day at the LEGOLAND Discovery Center in Columbus! I would definitely recommend a visit, especially for those with children aged 3-9!